My name is Alexa Fernandes and I started The Lady Entrepreneur because I was looking for like-minded women that were starting their own businesses too. You see, at some point durning late 2008, I had the bright idea of starting the type of laundry service that I would love. After much research, some luck, lots of tears, lots of money, and loads of resistance I finally opened Lady Bonilla Laundry in 2009. I'd love to say that I fearlessly opened up the laundromat but that's not true. I was riddled with fear, doubt, "Who did I think I was, to open a business without prior business knowledge?!" “Your just a flight attendant” Despite my fears, I worked through the problems that come with opening a store. Wouldn’t you know that we ran that store successfully from September 2009 till March 2017, 8 years!! I acknowledged my emotions AND moved passed them. I got clear on my mission, my why. I set myself up with a simple plan. I thought motherhood and settling down would rid me of my need to have a business, boy was I wrong! It’s sparked my entrepreneurial genes to maximum drive! Soooooo welcome my fellow entrepreneur, you are in the right place! I hope to provide you with a different level of service, one that makes you feel proud of being a Lady Entrepreneur! If you need help acknowledging your emotions, getting clear on your mission, and setting up a simple clear plan visit my work with me section or just click here. You’ve made it this far, say it with me.. 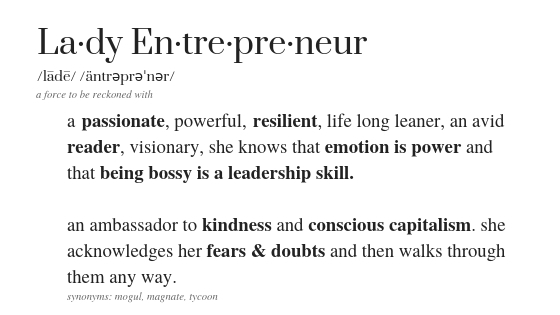 I am The Lady Entrepreneur. Join me and some of my friends for an experience you won’t soon forget!